We picked out Carter’s pumpkin today. It’s a special one, because she picked it our herself from the orchard! We drove to Center Grove Orchard, north of Ankeny about 10 miles. Before choosing just the perfect pumpkin, we took th tractor ride from the entrance about a mile toward the back of the orchard, and manuevered around the corn maze. Andy and Carter led the way … and we did have to turn around from a few dead ends! But we did make it out! Carter played with the straw and hay, and we took the tractor back. The trees and leaves were all changing colors, and it was beautiful! Next, we had a quick snack – a carmel apple and apple cider! YUM! We got to pet the animals, and then chose a pumpkin perfect for Our Pumpkin! It was a fun-filled fall afternoon! Carter and Mommy getting ready to go to the Orchard! Yeah! Daddy and Carter in the maze – which way now, guys? … and Carter and Mommy – a true batch of Pumpkins! Carter’s cider. Despite the death-glare on her face, she liked the treat and had a blast! So, I never want to hear, “she’s not naughty!” ever again! I adore Mackenzie and Kelsey! They are awesome chicks! But with busy schedules, it’s hard to find time to get together. So, we make time! Tonight, we got together for a Girl’s Night Out. 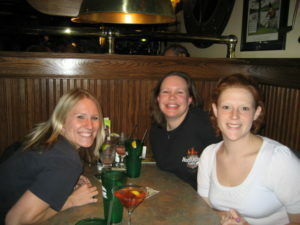 We had fattening food and drinks at Bennigan’s, and talked girl talk. Stuff like crazy men, outrageous baby stories, and wild adventures at work. And we laughed and giggled the whole time! By the time we left, most of the restaurant knew we were going to Sugarland. We got to the Val Air Ballroom, and parked across the street. Now, I’ve been to enough concerts to know that the guys who are helping you park and asking for money usually have a “security” shirt on, or some form of identification. Not an orange sweatshirt, overalls, and a beer gut! So when Toothless-Joe said it’d be $5 to park, the three of us looked at one another like … right … To get us moving, I paid him. And, yes, I know, he’s going to use my hard-earned $5 for booze! Whatever, it’s all in the name of Girl’s Night! The Val Air wasn’t what any of us expected. It was a little retro, in a good way, I guess. We wondered up to the floor area, which was general admission, and in our usual manner, made fun of others. The opener – some Ricky guy I’ve never heard of – played for about 45 minutes, and he sucked! My attention span was failing, and Mackenzie’s is way shorter than mine! Finally, finally!, Sugarland came out. It was crowded and hot, but awesome! They played all their good songs – and the crowd sang along, horribly off-key – and all their to-be-coming songs – which I loved! It was a blast! 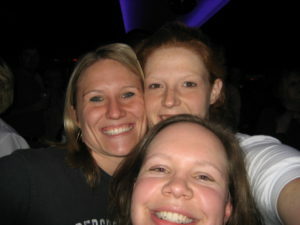 Sugarland was awesome, but spending time with Kelsey and Mackenzie rocked! The opener: Ricky something-or-other. He wasn’t so good, but neither was this guy’s bald head! Jennifer & Christian of Sugarland! YEAH! Sugarland is my favorite band EVER!